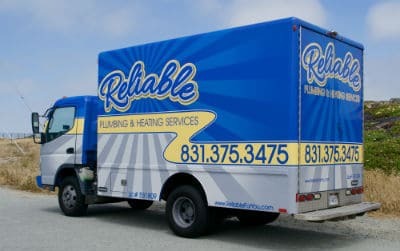 Why is Reliable Plumbing & Heating Services the best plumber and heating contractor in Seaside, CA? Well, for one, we’re a family-owned plumbing business with over 40 years of experience serving our local community. We have thousands of satisfied customers, and we treat everyone the way we would want to be treated. We offer a 100% satisfaction guarantee on all plumbing and heating work, and our techs are professional and highly trained. Our customers love the work we do, and they’re happy to share their experiences online. We have tons of great reviews on Yelp, Google+, Facebook and others. We look forward to the opportunity to earn your trust and become your go-to plumber or heating repair company. You will know the exact cost for your installation or repairs in a guaranteed Up-Front Price before any of the work starts. You won’t have to worry about how long the job will take and unlike many plumbing and heating companies we will never surprise you with hidden costs or extra charges ever. All of the staff at Reliable Plumbing & Heating Services are the best in the business. We hire the best, and then we train, train and train some more. We are up-to-date on all of the latest technologies, and we show up with fully-stocked repair vehicles, ensuring that most jobs can be completed in one visit. Call Reliable Plumbing & Heating Services for expert plumbing repair and furnace service 7 days a week, 24 hours a day. We have professional plumbers standing by, ready to take care of your problems, whether it’s a clogged sink, leaky faucet, broken toilet or any other repair.